If you’re recovering from addiction, The Gift of Recovery offers quick, in-the-moment tips and tricks to help you cope with daily stress and stay firmly on the path to wellness. With this gentle, easy-to-use guide, you’ll learn how to navigate relationships, take time for self-care, and build a mindful, sustainable, and joyful recovery. Deciding to get help for addiction is the first step toward recovery. But addiction recovery doesn’t happen all at once – it’s something that must be worked for, every day. Sometimes, it will be easy. When things are going well, you may not be tempted to give in to your cravings. But when life is stressful, you’ll need strategies to help you cope. 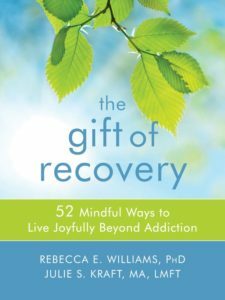 Written by the authors of The Mindfulness Workbook for Addiction, this on-the-go mindfulness guide offers fifty-two powerful and effective meditations to help you manage the stress, depression, and strong emotions that can get in the way of a full and lasting recovery. You’ll also find skills based in cognitive behavior therapy (CBT), dialectical behaviour therapy (DBT), and acceptance and commitment therapy (ACT) to help you stay grounded, as well as links to online resources. Deciding to overcome an addiction can feel like leaving a relationship. It’s hard and sometimes lonely – but it is truly an act of courage. This book will help guide you as you continue making courageous steps toward peace, joy, and fulfillment.